For me, the most useful thing about twitter is the ability to follow hashtags. I love to keep up with the back-channel during talks at conferences and events I go to. I also find that hashtags add a new dimension to live television, tags like #xfactor and #bgt generate an incredible volume of traffic providing ample distraction to cover the long advert breaks. Although I've kicked the trashy telly habit this year I haven't had to give up following along with twitter. The viewing public is great at self-organizing around hashtags and the UK's Channel 4 has even published official hashtags to use during political debates to quite good effect I think. Anyway, if there is one barrier to my full adoption of Google+ it is that hashtags are not a feature of that platform. Well, until yesterday that is. I spent the first half of this week at my employer's European Users Conference where we published the hashtag #qmcon to help people follow along on twitter. 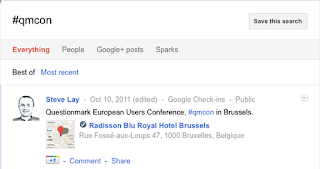 I used my mobile to check in at the hotel (in the Google+ sense) and used the hashtag in my comment. 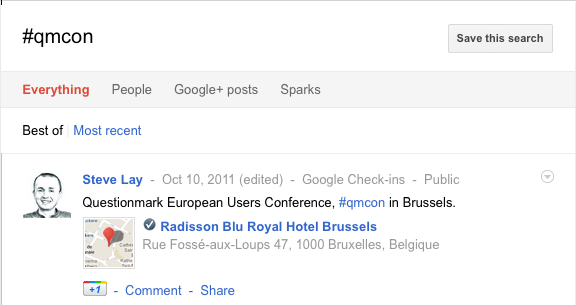 Now when I review my Google+ stream the #qmcon hashtag is clickable, clicking it generates the above screen shot. You can also put the hashtag straight into the Google+ search box at the top of the page too. Unfortunately there are business issues between Google and Twitter which means that a search in Google+ does not show results from twitter too. However, there is no reason why people with accounts on multiple services shouldn't cross post using automated services so I'd expect the content to converge and for future competition to be around the experience of consuming these feeds.